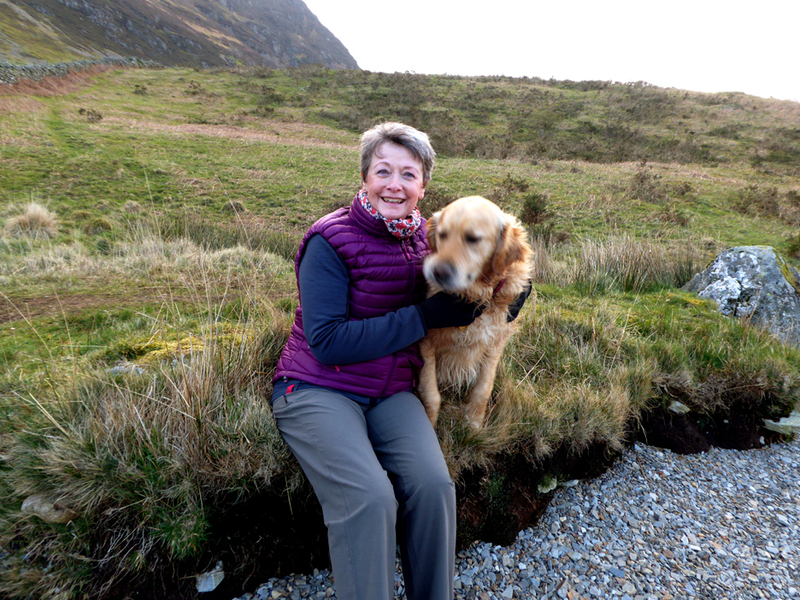 " Back home - with Jo, Dee and John "
Date & start time: Thurs/Fri 28/9th March, 2019. Places visited : Local walks to the Pump House, Sandy Yat, High Park and Flass Woods. 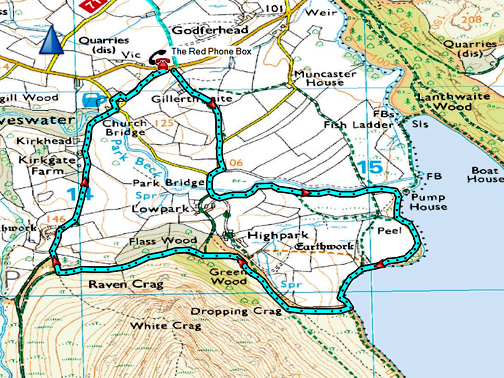 Walk details : An amalgam of two local walks of about an hour or so each. 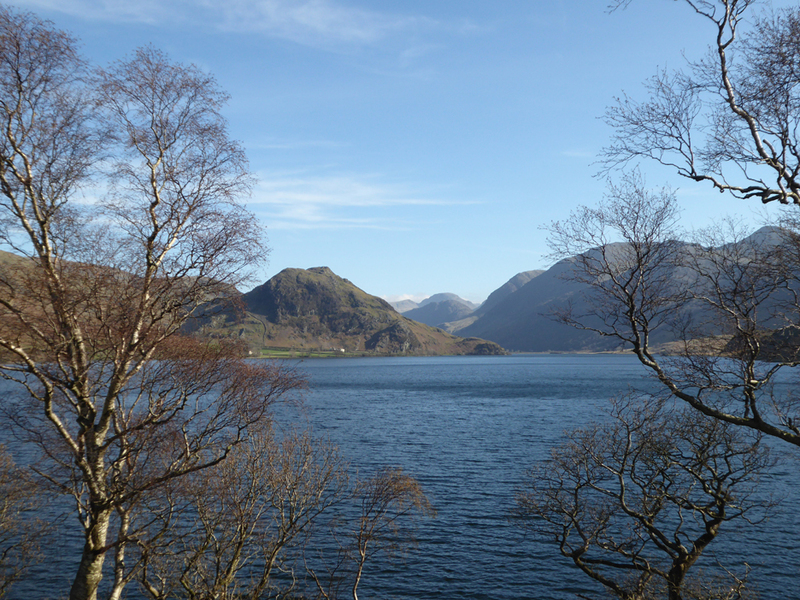 Highest point : Back home to fine weather in the Lakes. 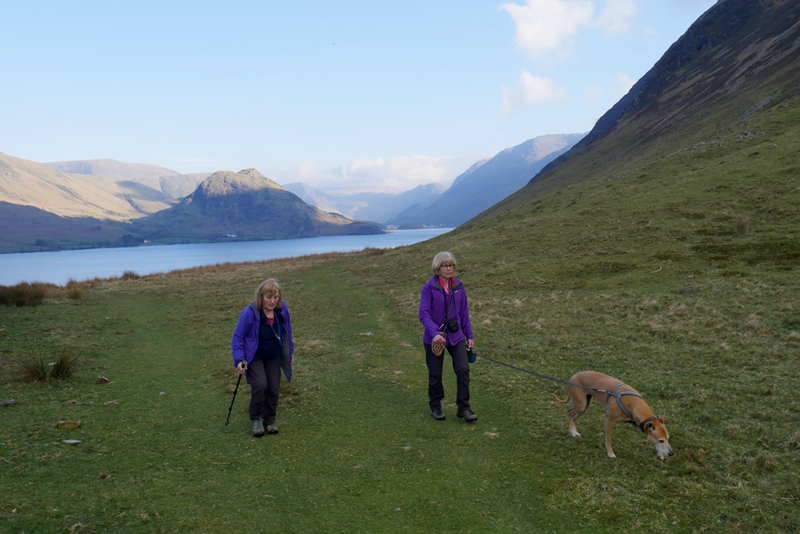 Walked with : Jo, Dee,and John, Ann and our dogs Amber, Dylan and Dougal. Technically an amalgamation of two local walks on subsequent days, but the weather was so similar they merge together photographically. 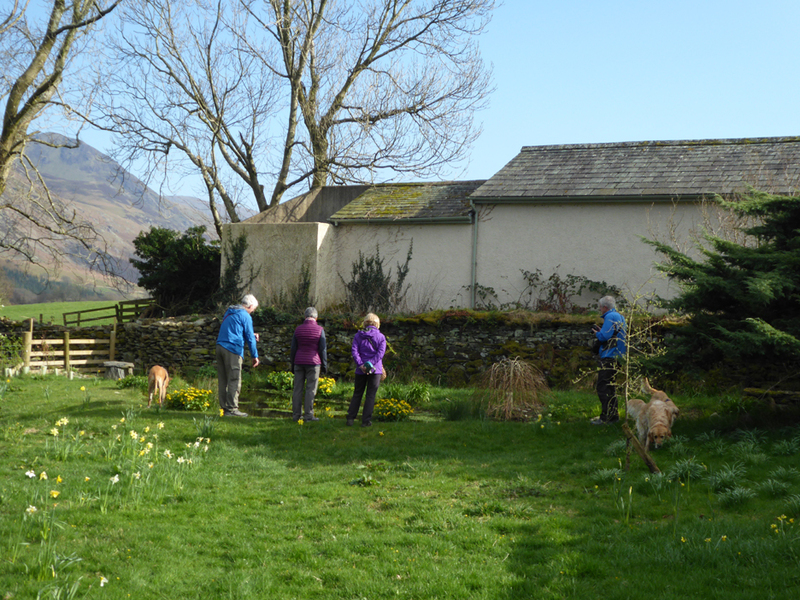 who were in Loweswater for a Friday afternoon walk and a chatty evening meal for five together, here at the cottage. 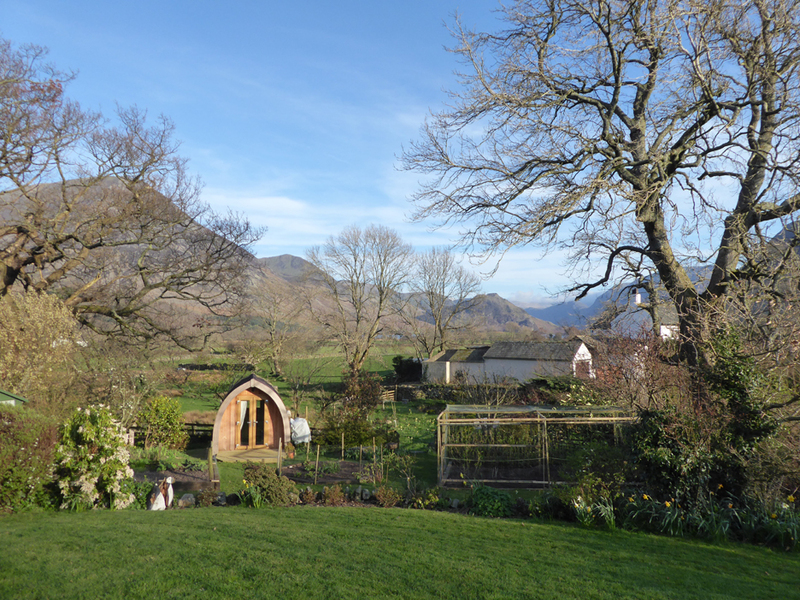 A new season has brought colour back to the garden, the paddock and the pond. 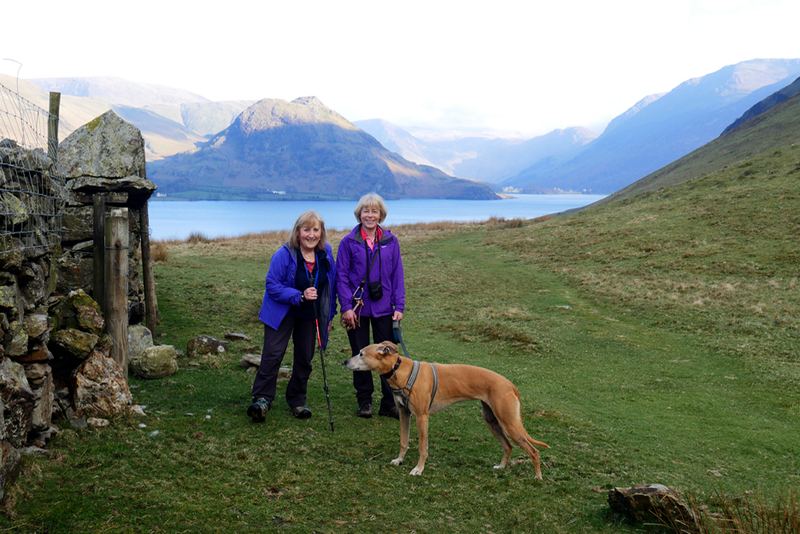 It has also brought wildlife visitors who have caught the attention of our two hounds. 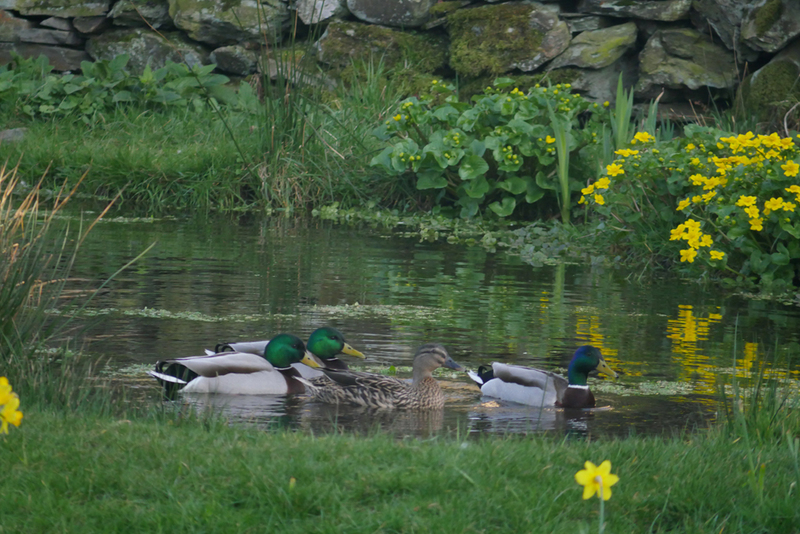 Our pond has had regular visitors in the form of a female Mallard and three males. Either she is a popular lady or she has successfully reared three sons ! It also explains why the water is often clouded with mud. They disturb it as they dip into the water, searching for food. No problem as it is effectively a large meander in a flowing stream. and the pond becomes clear again. 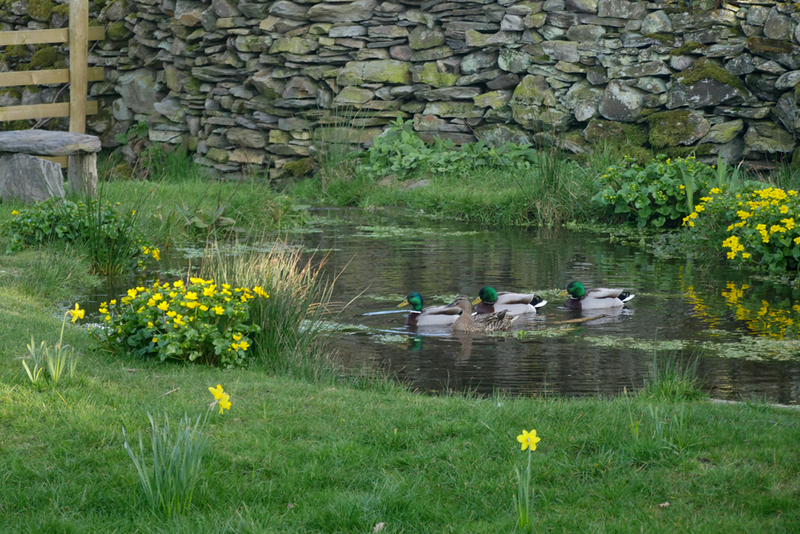 The problem with the ducks however is that they may be responsible for eating all the tadpoles. We haven't seen any in recent days. 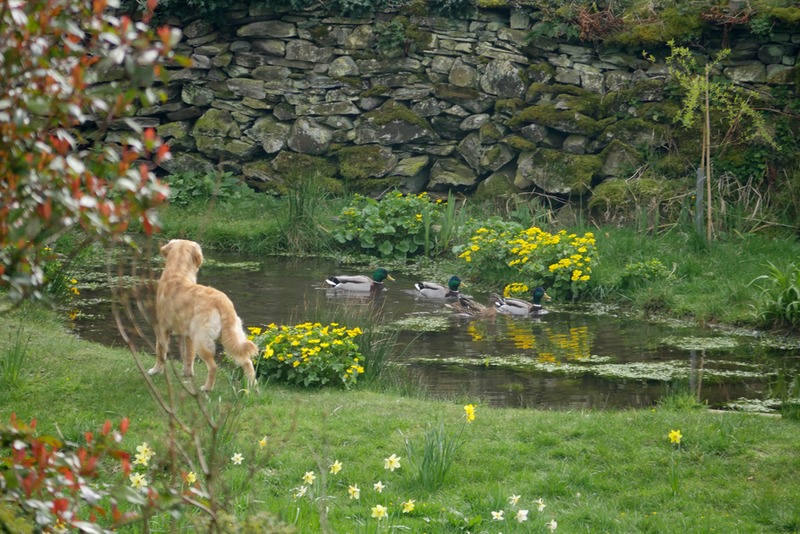 The ducks have a certain confidence and don't fly away when Dougal walks down . . . but they do cross to the far side of the pond. It is a different matter if he runs down or I suddenly appear, then they are quick enough to fly away. 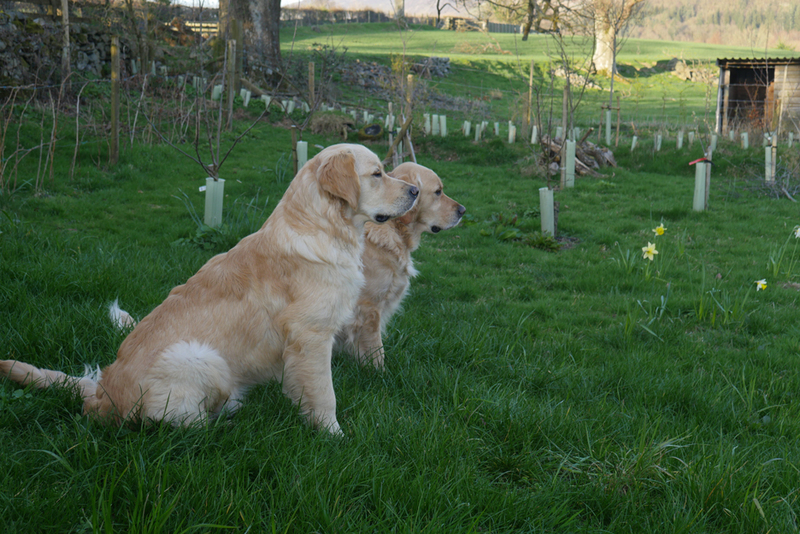 A team of frog-spotters are here today . . . but they couldn't find any signs either. 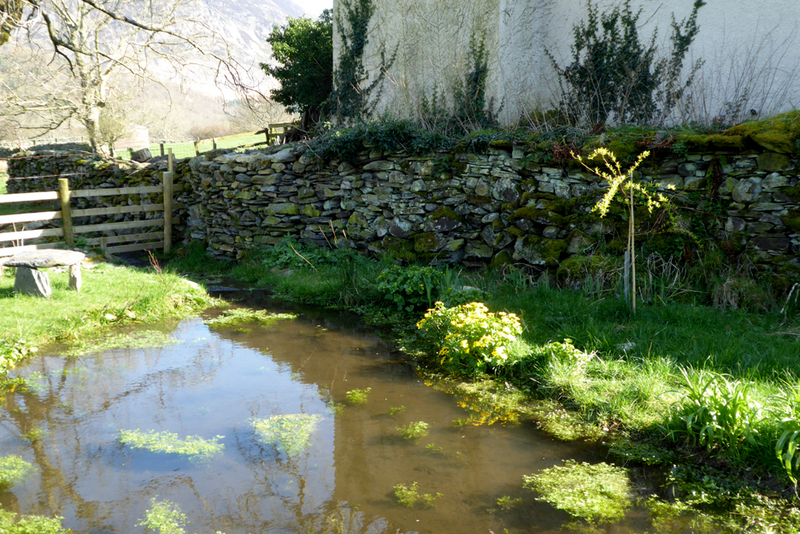 Still the marsh marigolds are looking good and the willows are sprouting leaves . . . and it is supposed to be a wildlife garden after all. and there's no point in adding more road miles for the sake of it. 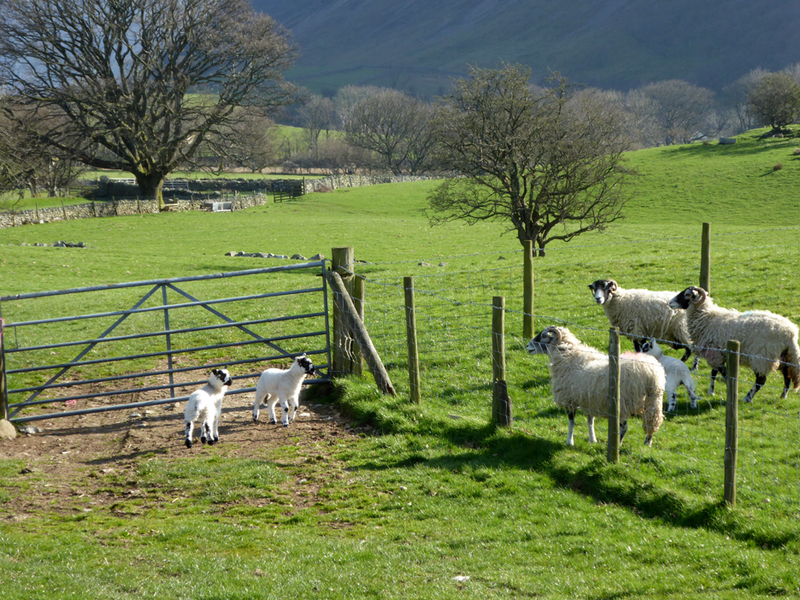 Our local farmer is well into lambing and the fields around us have new born lambs. Unfortunately they have strayed into a different part of the field from their mum, just the way we wanted to walk. Once they reached a point where they could go no further, they backtracked along the fence, meet up with their mums and all was well again. 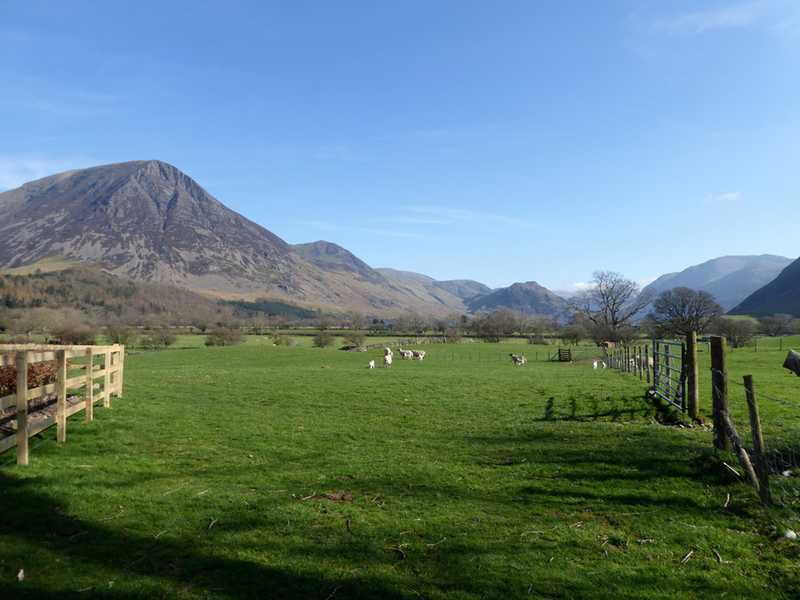 Across the bridge over Loweswater's Park Beck and on towards the Pump House. 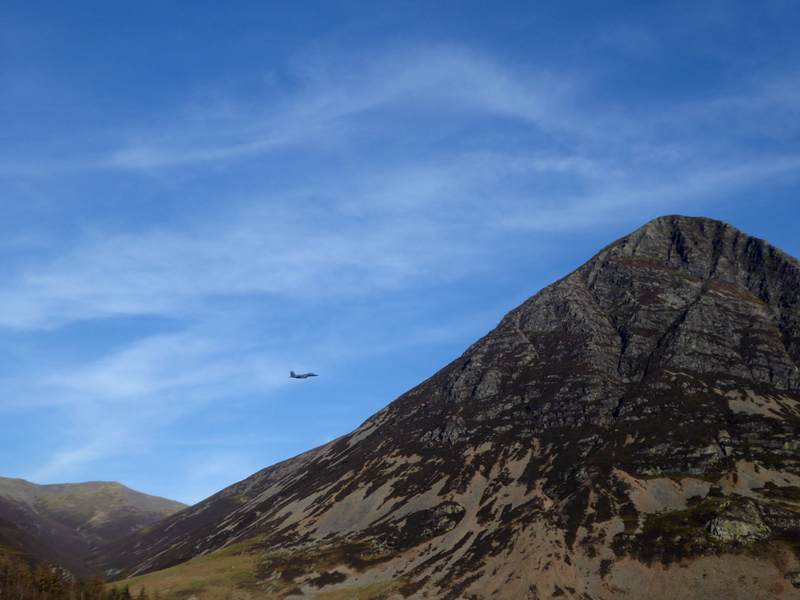 The northerly breeze has spread clear air across the country and the views of the all high fells are really good.
. . . but the tranquillity of the scene is shattered, twice, by the passing of two low flying aircraft. 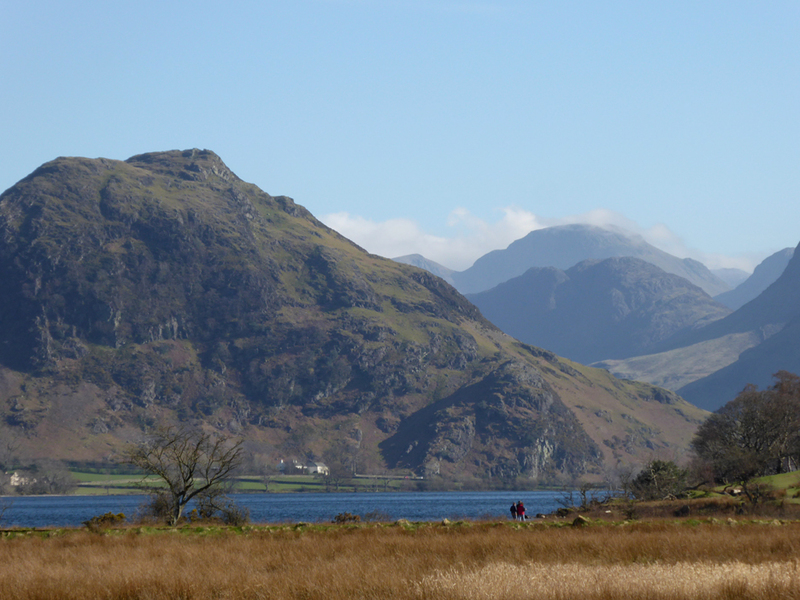 Looking across to Rannerdale Knotts, with a couple of folk to add scale to the picture. 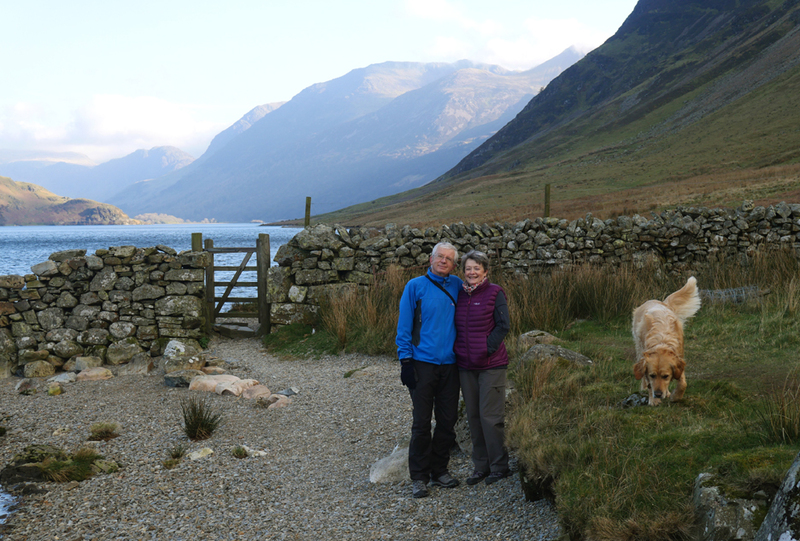 When I got closer it turned out to be ex-neighbours Todd and Sheila, who still live locally and who have also decided on a lakeside walk. 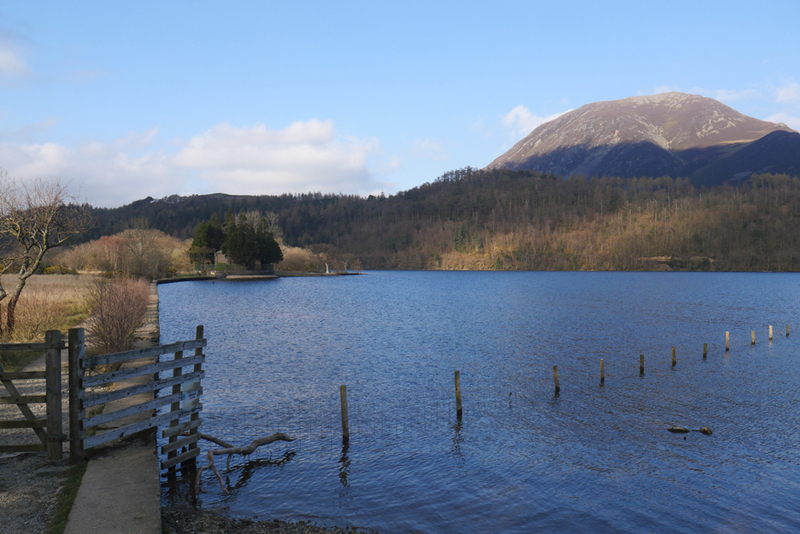 Looking back at the Pump House, the bright blue of the sky reflecting beautifully in the water. The skeletons of ancient pines that fell twenty years ago. The main trunks are overgrown with grass and slowly decomposing, so are not the handy lakeside seats that they used to be. 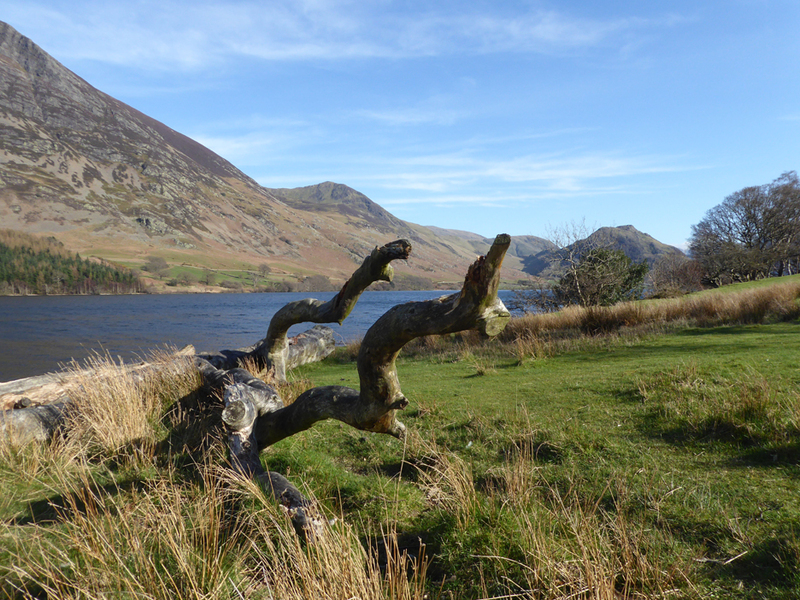 Around the end of the Peel and we get a nice tree-framed view across Crummock Water to the high fells. 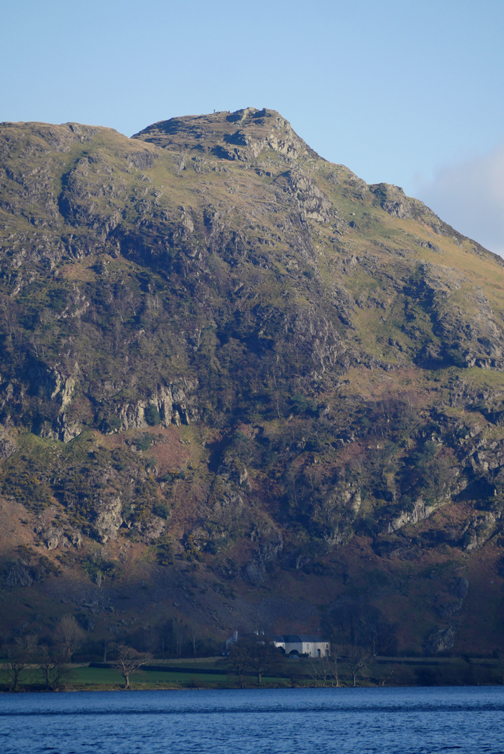 Zooming in on Rannerdale Farm, seemingly nestled under the crags. 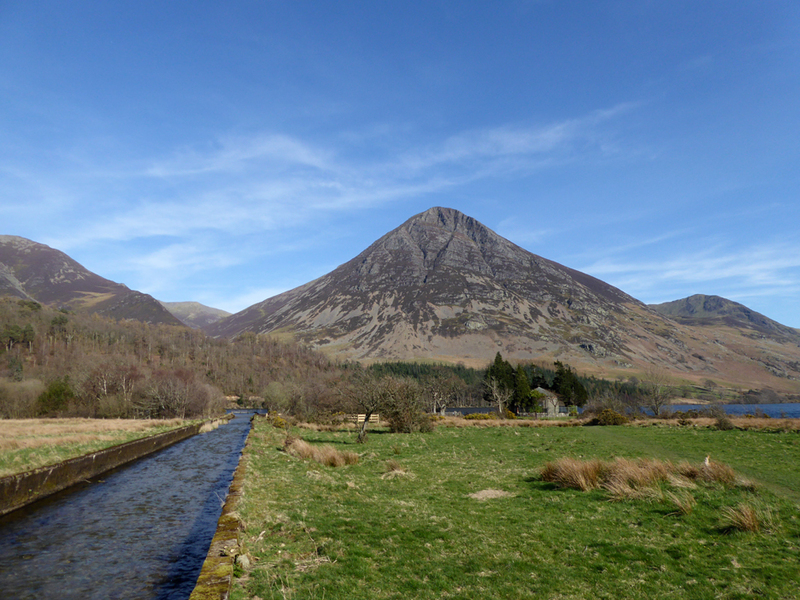 Red Pike beyond High Ling Crag and the steep slopes of Mellbreak. 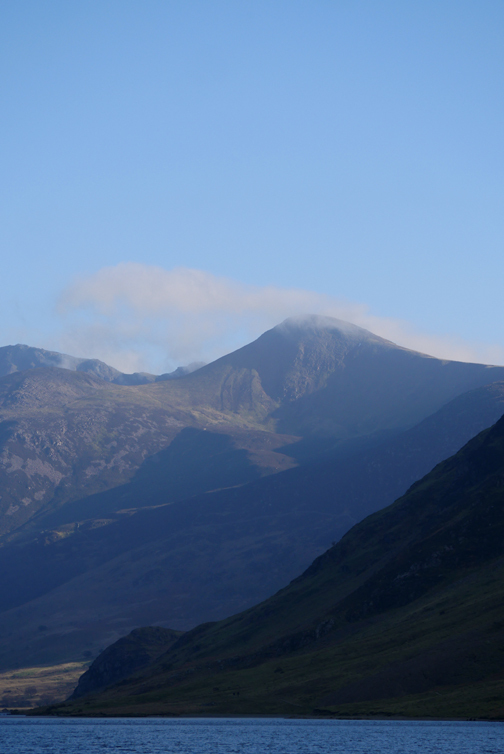 Rocky Haystacks above Hause Point. 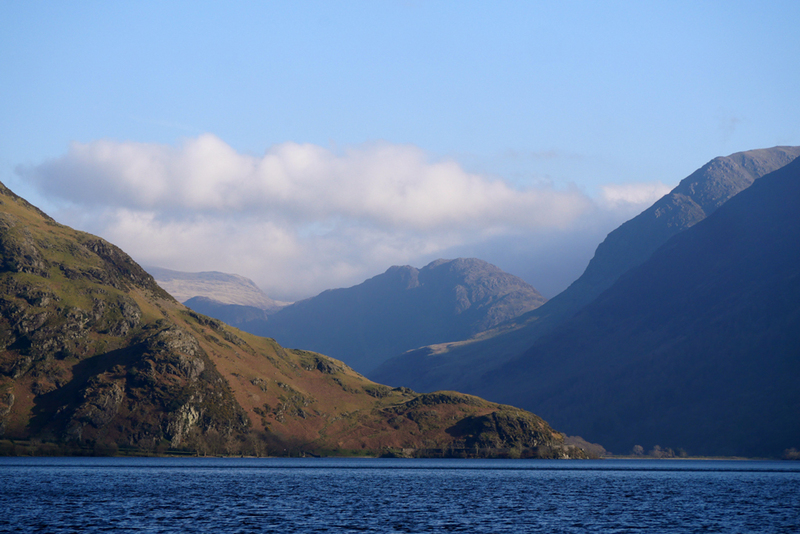 Great Gable and Green Gable behind have disappeared due to some passing high cloud. Dee down on the pebble beach of Sandy Yat . . . which should really be called Pebbly Yat ! Yat is Cumbrian for gate . 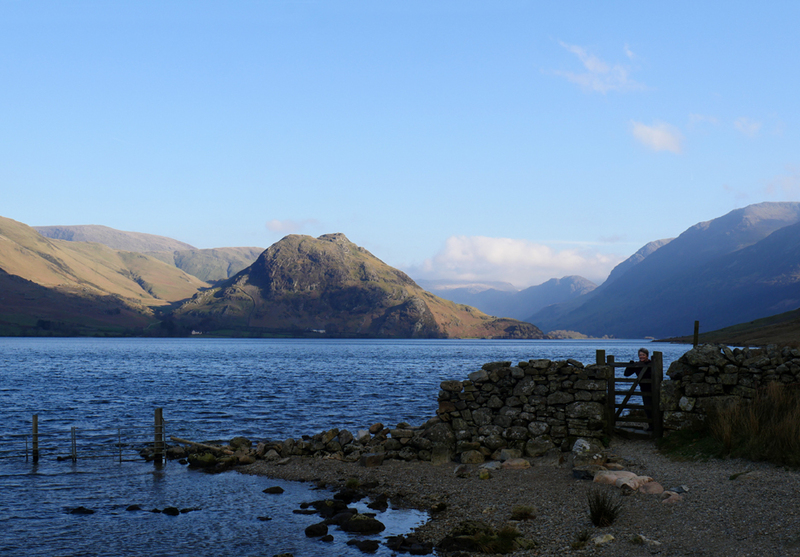 . . and the beach is suitably divided in two by a kissing gate and fence that extend into the lake. and possibly provides a backdrop to Dee and John's next Christmas card ? Dee's sneaked into this one too ! Ann, Jo and Amber . . . the candid photo. They preferred a more 'smiley' shot ! 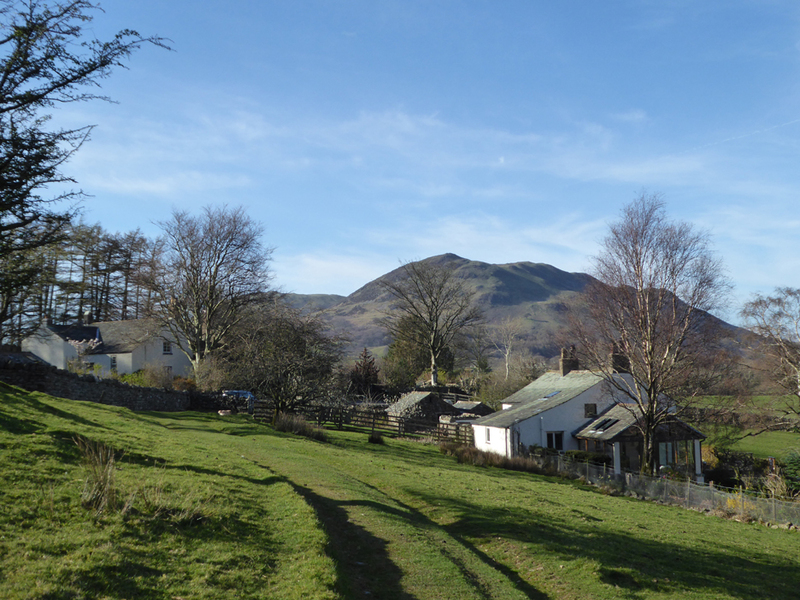 Mellbreak Cottage and High Park House with Low Fell in the distance, now that we have turned for home. 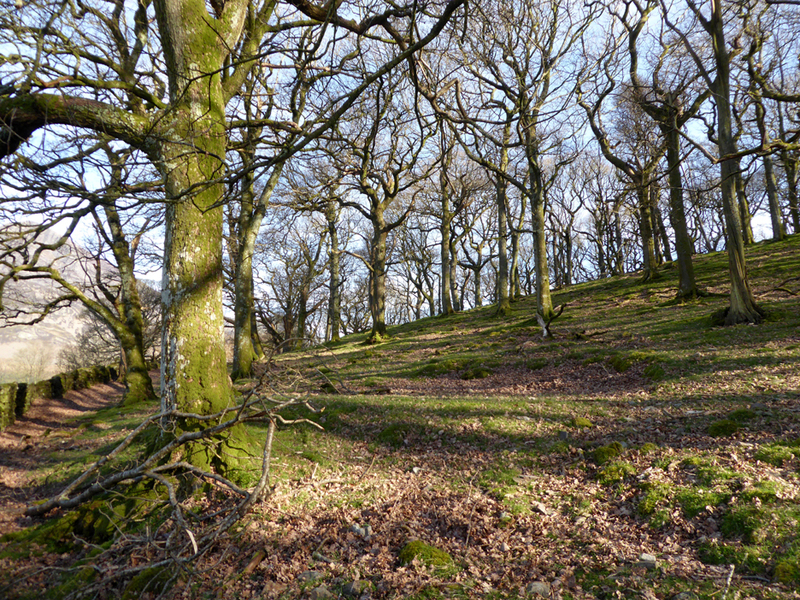 Green Wood and Flass(white) Woods are mixed woodland that grow below the northern end of Mellbreak. In the woods are five or six of these artificially levelled platforms, each about six meters in diameter. They match exactly the type of platforms built by charcoal burners in woodlands elsewhere in the county. Perhaps this is a indication of past industry of this valley and the reason why the woods survived here whilst others locally have disappeared. 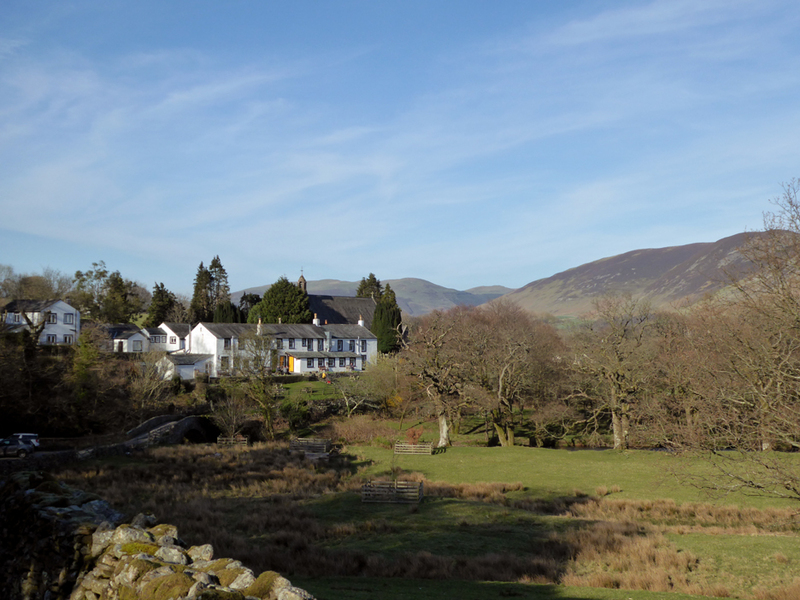 Round via Kirkhead Farm and down towards the Kirkstile Inn and the Church. 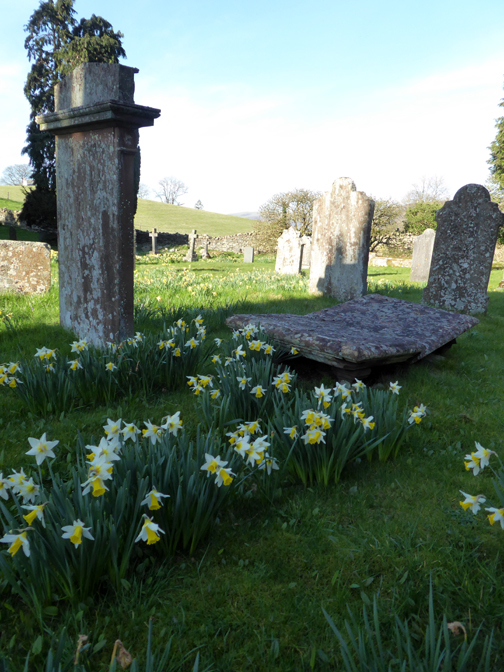 Lovely Daffodils have followed the crocuses in the graveyard. 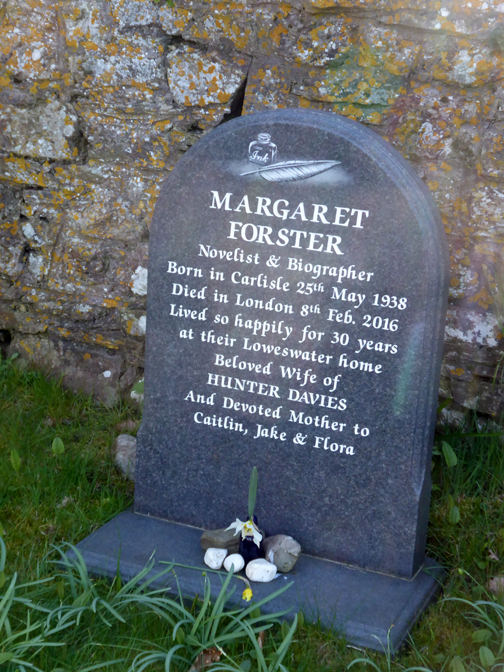 One of the more recent gravestones. Nearly home now . . . whoever's first into the kitchen . . . put the kettle on ! This site best viewed with . 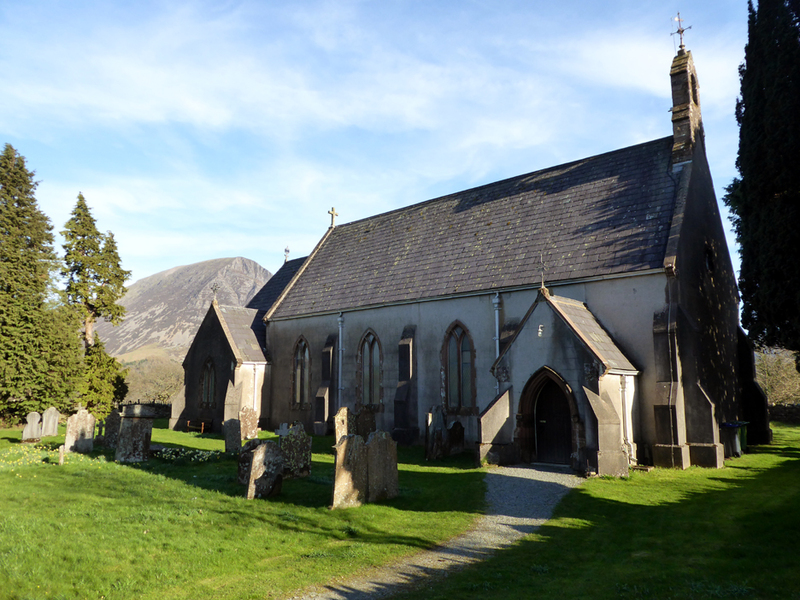 . . more clues to our local heritage.